The elderly gentleman beside me in the coffee shop was doing a colouring page on his touch screen laptop. Christmas carols crooned to us over speakers, people chatted to each other and customers shouted orders to the baristas. There he sat, still except his hand moving the stylus. He was carefully perfecting the one corner, smiling to himself, content. A calm spot in the hustle and bustle of meetings happening around us, rushed hellos and goodbyes, job interviews. It’s not unrelated. That man was doing something so simple and was so happy. He sat beside me for over an hour, making sure the one picture was exactly how he wanted it. So zen and peaceful. Normally, I start the holidays saying I’M going to stay zen and peaceful, but then I start piling on tasks and buying over the top gifts- it spirals from there. My health always takes a hit, I feel as if I’m behind in “keeping up with the Joneses” and I spend a lot of late nights making things that will probably be forgotten in a month. 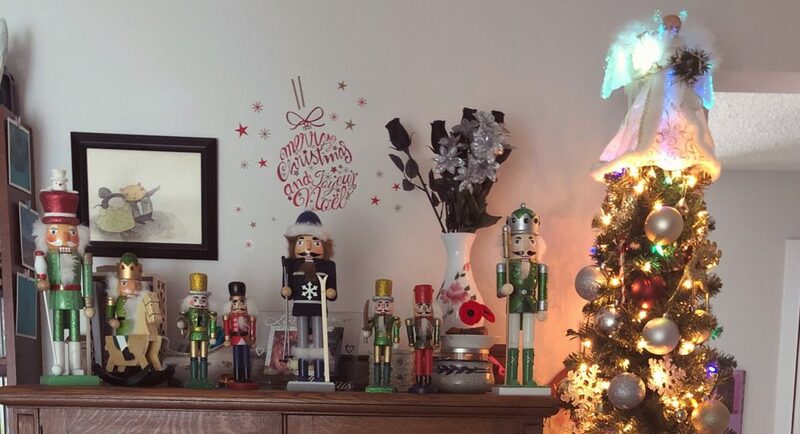 I just love Christmas so much and I used to show my love with THINGS. With things that people expected, not that came from the heart. With things that would be forgotten or would be arduous to do, leaving my health behind. Not this year. I’ve started meditating, eating right and exercising again. If I pile on too much this year, all of that will be forgotten. I will push it to the back because “I don’t have time”. I can show love and put other people first without making myself last. My kids decorated the whole thing by themselves this year! They’re getting too old, too fast. No Christmas cards: I will post a family Happy Christmas update here and share the link to anyone interested. This is huge for me, as Josh used to joke that I kept Hallmark in business. But, with my new fondness for eco-friendly solutions AND my Year of Less, I’ve decided not to do a massive card sending this holiday. Minimal gifts: I am no longer going to give something to everyone. This year is about the kids. I have a few families I am giving small presents to and that’s about it. Friends that are as dear to us as family are getting physical gifts for their kids. Nothing big and nothing with a bunch of wasteful packaging. I’m simplifying it all. Josh and I have decided to do charity donations for the rest of our list, as most of the people on our list are in the process of decluttering or moving- seems mean to add to the stress. (And, coincidentally, this helps our pocketbook, too. The kids can’t share a room much longer! Last year I spent $2000 (!!!) on Christmas, and paid for it all year). It’s all about the kids: I spent all year getting rid of stuff I don’t want. I don’t need to add new stuff to that. Josh and I might get one small thing for each other, or we are playing with the idea of buying each other a hiking backpack and leave it with one gift between the both of us. We will get the kids two gifts and that is IT. I always go overboard, I think to compensate for having nothing as a child. My dad would always go nuts at Christmas because during the year we couldn’t afford anything, but I could feel the financial strain on them all year. I’ve kept up his stupid way of doing things. My kids are spoiled. They can do with two gifts and not miss out. It isn’t about the gifts, but the family time anyway. Less shopping: I plan to avoid malls this year, except to look at the pretty light displays. I don’t plan to do any real shopping there. Donations for adults, online gifts for friend’s kids, and we are done! Our kids will want to get us something, so on the weekend I’m going to take them to Calgary’s Heritage Park! They have a building set up for parent-free shopping. Volunteers take your kids, their money and the list you filled out on who they’re shopping for, and take them shopping. It’s all cute things you could buy in Heritage Park. Last year I waited on a chair for a half hour while the kids went behind a curtain and picked stuff out. The volunteers wrap it so that you can’t tell what it is and the kids feel ten feet tall. It’s really wonderful. That year, Hunter got me a paint-a-robot craft and Isabella got me a bird chime with a motion sensor. I loved them both. 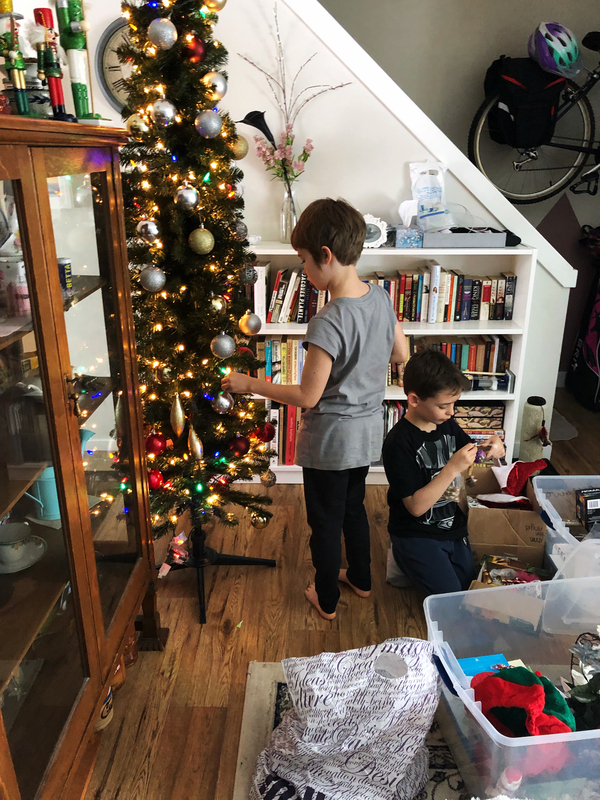 More family time: Our kids, tiny highly-sensitive introverts that they are, complained about never having a Christmas in our new home, to ourselves. After a long talk, I think we have come to a compromise. Instead of feeling that they are entertaining all day or rushing around, we are going to set aside a chunk of time. Just for the four of us. I was shocked when they asked for this, but also secretly thrilled. You would think it was my design but it came from the kids. Introverts for life, hey? Haha. Our compromise is that Christmas morning will be for us. Just the four of us to quietly do as we please. We will open presents as slowly as we like, eat brunch, watch Home Alone and cuddle or play. There will be no visitors allowed, no phones on, nothing to interrupt. Our kids are growing so fast and we spend so much time running from one task to the next, I think this planned time together is so important. So that’s my plan! Let’s hope I don’t get all sparkly-eyed over the well-placed ads, or swept away by some mall display, and wake up one week later, covered in boxes and short $400. You laugh, but it’s happened before. What are your holiday plans?? ?